Last nite I got the weirdess dream I ever have. I hate that dream. It was disgusting! What am I thinking??? How could I dream those things? Yikes! Anyway, my boss' secretary, Mbak Tutik, asked me to be in the office today. My job is an assistant for my lecture, Ibu Sri Adiningsih. 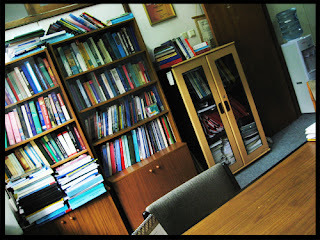 That is why this morning, I went here, to my office, that located in my campus, Economic Faculty UGM. My office is just perfect. There is an air conditioning, dispencer, many snacks, 3 active phones, 3 computers with 24 hours internet active, free printer (that I can use for my homeworks), and many economic books! The place is just to good to be true. Its cool and quiet. Ahhh... God must loves me very much. But the thing is, many gossips around the campus told me that theres a ghost infront of my office named Mbak Yayuk. 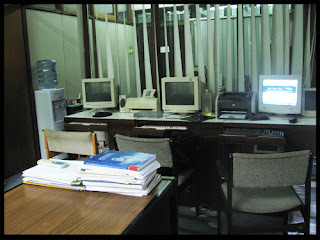 So eventho I love to be in my office, I cannot be here over 3 PM cuz it will scares me so! Ok then, enough for now. Many friends are active and chat with me in my Yahoo Messenger. Well, enjoy the day.